The demonstrations in an oil-rich region could exacerbate the problem of declining spare oil capacity. Over the past week, protests have erupted in Iraq’s oil-rich Basra province. They have now spread throughout southern Iraq and beyond, reaching Najaf, Karbala, Dhi Qar, Maysan, Muthanna and even Baghdad. Protesters are angry over the lack of jobs and poor public services. Basra accounts for about 80 percent of Iraqi’s oil reserves and roughly 3.2 million barrels per day in oil exports. Iraqi police have reportedly killed as many as four protesters, and Iraqi Security Forces have been placed on high alert. Local government offices, as well as Dawa Party offices, have been attacked, and airports have been stormed, forcing several airlines to temporarily suspend operations. On Friday, Prime Minister Haider al-Abadi flew to Basra from Brussels, where he attended the NATO summit, to begin talks with regional leaders. The threat to Basra’s oil production has much broader implications due to a new report by the International Energy Agency that spare oil capacity is being tapped out. 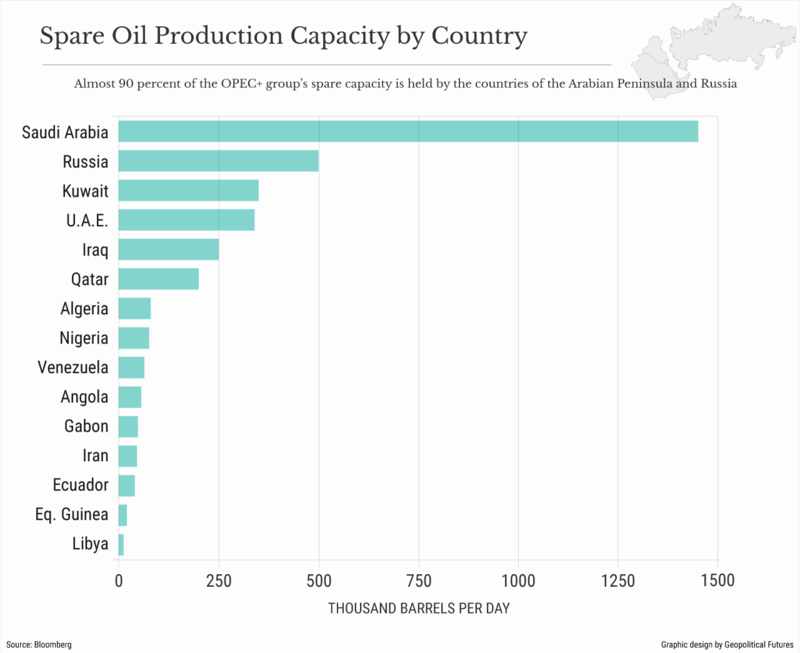 As OPEC countries boost oil production in response to lower supplies from Venezuela and in anticipation of declining exports from Iran, spare capacity is being stretched thin. This shouldn’t be a surprise – as production increases, spare capacity is bound to fall. But as the ability of oil producers to increase supply declines, prices can become volatile, especially if supplies can no longer meet demand. And since global demand isn’t expected to decrease anytime soon, unexpected supply shortages during a period of unusually low spare capacity may have a significant impact. If a substantial portion of Basra’s oil production is brought offline – which hasn’t happened so far – then it could exacerbate the problem of declining spare oil capacity. So far, it appears as if the uprisings in Basra have been driven by local residents rather than external forces. But there have been some reports that pro-Iran Popular Mobilization Forces militias were deployed to support the protesters. (There were also reports of protesters attacking the offices of the Badr Organization, the largest pro-Iran PMF group in Iraq – possibly a sign that, although Iran has links to the protests, it isn’t really controlling them.) Tehran may be doing this as a way to threaten global oil supplies at a time of lower-than-normal capacity just as U.S. sanctions are set to kick in. This would certainly be a dangerous game for Iran – shutting off Iraq’s major source of revenue could create instability that Sunni insurgents could take advantage of, at a time when Iran itself faces significant challenges at home. But Iran may want to demonstrate that it has the power to inflict pain on the global economy. The challenge with supply shortages is that they are often unpredictable and can come from myriad events. For example, production at Canada’s Syncrude oil sands facility, which produces 360,000 bpd, was shut down in June after a tripped transformer caused a power outage. It’s expected to remain offline at least through the rest of July and possibly into September. Other short-term outages have occurred in Norway, Libya and Nigeria, and hurricane season could disrupt production at U.S. facilities. Supply disruptions are even more worrisome because global demand is expected to continue to rise. The IEA expects demand to increase by 1.3 million bpd in the second half of this year and by 1.2 million to 1.6 million bpd in 2019. At the same time, new pipelines in the U.S. are expected to increase transport capacity by over 2 million bpd, making it easier to bring inland oil to the global market. In the long term, greater supply from U.S. shale producers still appears to be enough to offset the losses that are expected from Iran and Venezuela. In the short term, production levels are far more difficult to predict. Nevertheless, the combination of strained transport infrastructure in the U.S. and decreasing production in Iran and Venezuela may cause prices to stay elevated through 2019, when new pipelines in the U.S. are expected to come online. Spare production capacity is also hard to measure. Though both the U.S. Energy Information Administration and the International Energy Agency report figures on spare capacity, there’s a lot of skepticism about the accuracy of these figures. Saudi Arabia, which has the greatest spare capacity of any oil producer, claims that it can produce 12.5 million bpd but has never produced more than 10.7 million bpd. Even if it can produce more than it is currently, doing so may require additional drilling. And even at sites that do not require additional drilling, maintaining the operability of offline machinery is costly. Increasing production isn’t as easy as flipping a switch; it could take months even at sites with well-maintained equipment. The EIA estimates that OPEC currently has about 2 million bpd in excess capacity, with Saudi Arabia accounting for the largest portion by far. Though the EIA claims that Saudi Arabia usually maintains about 1.5 million to 2 million bpd in excess capacity, it’s currently producing at higher-than-normal levels, so its excess capacity is believed to be closer to the lower end of this estimate. If OPEC’s total spare capacity is 2 million bpd and Russia’s is roughly 500,000 bpd, the total global spare capacity is about 2.5 million bpd. But Russia, too, is already producing oil at historic levels – nearly 11.2 million bpd in early July – so its excess capacity may be lower than normal. In theory, given that Iran and Venezuela have an estimated 1.5 million to 2 million bpd in offline oil supplies combined, global spare capacity should cover this shortage until additional transport infrastructure in the U.S. becomes operational in 2019. Still, any potential shortages resulting from, say, the protests in Basra would have a bigger impact. Even the mere possibility of limited excess capacity has political consequences in the U.S. and, therefore, geopolitical implications in the Middle East. In response to the U.S. threat to curtail Iran’s global oil exports, Iran has threatened to close the Strait of Hormuz to all oil transport. (Part of the strait is controlled by Oman and patrolled by the U.S. Fifth Fleet, but Iran could still block passage by, for example, laying mines across the strait.) This isn’t the first time Iran has threatened to close the strait, and it hasn’t actually done so yet. But given that nearly 20 million bpd out of the total 100 million bpd produced globally pass through the Strait of Hormuz, Iran could cause a major disruption to global supplies if it makes good on its threat. This may be part of Tehran’s strategy to push back against U.S. sanctions. If the strait were closed, it would cause a significant spike in oil prices, which would have an impact on the U.S. economy and, as midterm elections approach in November, on U.S. politics. Even the sanctions themselves are likely to cause some increase in global prices. The U.S. Congress will therefore be exceptionally wary of any action that risks a radical increase in the price of oil. The economy will likely be a major issue in U.S. midterm elections, especially considering the trade dispute between China and the United States. Lower spare capacity, therefore, also gives Tehran more leverage as the U.S. withdraws from the nuclear deal and other signatories consider their next moves.